It can be argued that a workbench is one of the most essential woodworking tools in your arsenal. After all, it is at the center of all your activity and is where you will work on many projects. It is due to this purpose that you need to find a workbench that is sturdy, suitable for various woodworking projects, and versatile. With all of these requirements, it can be difficult to determine what the best workbench for you truly is. This is why we decided to handle this task for you and to pick out the ones that offer the best value. 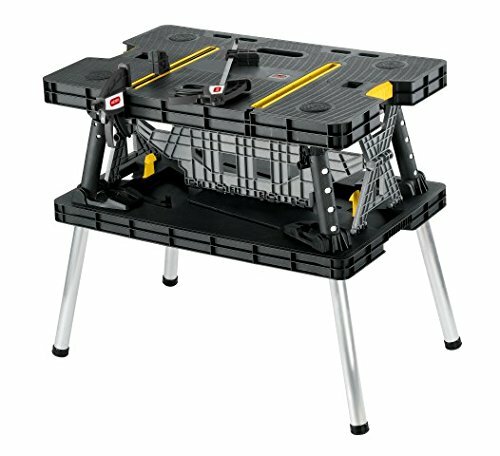 If you tend to carry out your woodworking projects in a number of different locations, then you will certainly find that this compact, folding workbench is just right for you. This is because when it is not in use, the workbench can be flattened and folded into a convenient carrying form. The only real issue with the folding feature is that the clamps that come with the table can be tricky to get into place. The workbench does have a swift opening system device to make sure that you can get set up very quickly as well. Despite this, you will find that it is a rather roomy workbench with dimensions of 33.46 x 21.65 x 29.72 inches, ensuring that there is ample space for you to work on. What’s more, there is also a second tier that you can use to keep or store your tools while working. One of the features that definitely make this workbench stand out is its sturdiness. It is able to hold up to 1000 pounds in weight. Not only does this allow the workbench to withstand the weight of tools, but it also ensures that you can put weight on while working on various projects. Made from polypropylene resin and steel, the workbench is more than just strong – it also works well in a number of different environments. So, if you find that you have to frequently work outdoors then this will be a good match for you. Do you want to minimize the pieces of equipment in your workspace? Well, if so, this work table will certainly come in handy. Although its main purpose is a workbench, it can quickly and easily be transformed into a sawhorse, making it even simpler for you to carry out a number of different projects. 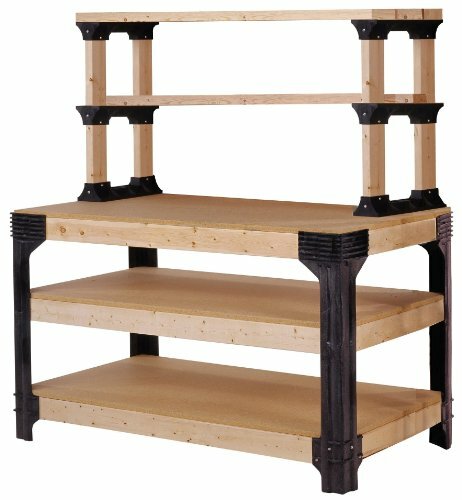 At its full size, this workbench has a surface area of 31 x 25 inches and is 32 inches tall. As you can see, this means that you have quite a bit of space to work on. There is also a level below the main surface available for you to store tools or materials that you may need. To make it even better, the table is incredibly strong and is able to withstand up to 300lbs as a workbench and 1000lbs as a sawhorse. Despite this, the workbench can be folded down into a more compact size, with a depth of just 5 inches. As a result, you will have no trouble simply packing this table up and moving it to another spot. The only issue with the folding mechanism is that it creates a slight groove in the middle of the table, meaning that the table isn’t level at every point. As an added bonus, the table is also equipped with two quick clamps and four clamp dogs to help you secure any materials that you might be using. If you are someone looking for a DIY workbench that you can customize to your needs, then you will find that this is a good fit for you. Now, it should be noted that you will have to supplement your own lumber for this project as it only contains four workbench legs, six ShelfLinks, and all of the hardware that you need to complete it. There are also detailed instructions provided. So, what are the perks of you getting such a workbench? Well, for one thing, it lets you create a workspace that is more suitable to your needs. You can get your preferred length up to 8 feet and preferred width up to 4 feet. Also, you won’t just be creating a workbench for yourself – you will also be putting together additional shelving. This will give you a place to store your tools and materials and keep your garage more organized. Yet another advantage is that this is an incredibly strong and tough workbench. In total, it is capable of withstanding 1000lbs in weight, making it more than suitable for all of your projects. All of the provided components of this workbench are made from tough and high-quality materials, ensuring that what you have built will last you for quite a while. If you don’t have much space in your garage and are looking for the most compact option possible, then this BLACK+DECKER Workmate will serve you well. The dimensions for the workspace are 33 x 5 inches and it is also foldable, making storage an absolute breeze, regardless of how small your garage is. Of course, this minimal workspace can also be a bit of a downside as it can limit the number of projects that you can complete on such a small surface. Despite being such a compact workbench, this model is still rather sturdy. So, you will find that it is able to hold up around 350lbs. This means that it can take the weight of a number of different tools and materials. This is largely because it boasts a durable steel frame. The workbench is also equipped with non-skid feet that ensure that it stays in place while you are working on it. The workbench also has adjustable jaws which makes it a lot easier to hold a variety of different materials in place, regardless of their shape and size. The jaws are also resistant to any kind of warping so you can be certain that they will remain in good condition for longer. This is a great product for anyone looking for a well-rounded workbench. This is because, in addition to the workbench, you also get a pegboard where you can store your tools. 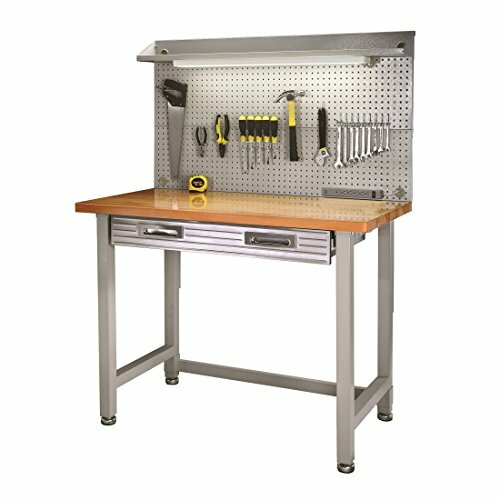 This workbench also comes with a stainless steel drawer that is heavy duty enough to hold all kinds of tools and equipment. There is even a cantilever shelf at the very top of the workbench. Now, it should be noted that this workbench does require a certain level of effort in constructing it. So, it may be better suited to those who have some experience in this manner. Apart from this, however, there really are no other complaints. You will be pleased to know that there is quite a bit of workspace on this bench as its dimension are 48 x 24 inches. It is also 37.5 inches tall. This is a strong, tough workbench thanks to its durable steel frame that is complete with leveling feet. The materials also have a powder coated finish that ensures they are well-protected from corrosion and other types of damage. To top all this off, the workbench also has built-in lighting which makes it a lot easier for you to work in different conditions. Woodworker’s Bench: as the name suggests, this is a workbench that is largely meant for woodworking. It is equipped with a number of additional features such as vises and pegs which are all implements that can be utilized while woodworking. These workbenches also tend to be incredibly strong and sturdy. Backboard Workbench: while this workbench is similar to that of the woodworker’s bench, the main difference is that it contains a backboard. This backboard can be used to store your tools and you may even find that it contains some type of shelving as well. These workbenches tend to be rather versatile and are suitable for a number of different projects. Portable Bench: these are compact workbenches that can be folded into a smaller size. This allows you to carry them around and are suitable for people who have to keep relocating for their projects. These workbenches are often rather lightweight as well, making them easier to lug around. Since workbenches are typically made for different kinds of construction and woodworking projects, they need to be sturdy and durable. This can typically be determined by the materials used to build these benches. It is a good idea to look for a frame that is largely composed of steel. This material has a tendency to be rather strong and is sure to be durable for a longer period of time. To prevent it from corroding, consider a frame or components made from stainless steel. As for the worktop, there are a number of materials used. The most common are wood and plastic, although you may also find that some worktops are composed of steel. If you need a tough and sturdy surface to work on, then you should go for a good quality, thick wood as these can withstand the test of time. On the other hand, if you will be working with electric or power tools, you may find that a plastic surface is actually a great deal safer for you to work on. Of course, you should make sure that a laminate layer is coating the surface to avoid any scratches or damage. As you can imagine, the workbench has to endure a considerable amount of stress every time you use it. Now, as mentioned, the materials used can go a long way in ensuring its durability. Still, it is important to determine just how much weight the workbench can support. Then, you will need to take the type of work that you do into consideration and figure out just how much weight the bench needs to hold. If you only do light to medium weight woodworking tasks, then you should find that weight capabilities around 300 to 350lbs should work well for you. For more heavy-duty activities, though, you will need something that is closer to 700 or 1000lbs, just to be on the safe side. If you are going for a woodworking or backboard bench, then you will have a bit more worktop space to utilize. On the other hand, portable workbenches may not offer up such dimensions. In the end, it is all down to the type of tasks that you complete. If you tend to focus on heavy-duty activities with large pieces of material, then you are going to need a much larger workspace. However, if you want one for minor tasks, you will find that most compatible workbenches provide you with all the space that you need. You are going to need a place to store your tools and materials while you are using the workbench. At times like this, you will find that shelves and lower tiers can be rather helpful. So, if you are working on projects with a number of different components, you should definitely look out for these features. These, of course, are temporary storage solutions. If you want something more permanent, get a workbench that has drawers, sturdy shelving, and pegboards. These will let you store all of the tools and equipment that you need. Stability: it isn’t enough for a workbench to just be strong, tough, and durable. It also needs to be stable and sturdy. So, when considering a workbench, make certain that it can be completely still while you are working on it. Height: most workbenches are between 32 to 40 inches tall. However, it is important that you find one that is suitable for your height. This is the only way to ensure that you will be in a comfortable position while working on your projects. Easy Setup: there are some workbenches that do need to be set up. If you decide to opt for one of these, make sure that the kit includes all or most of the necessary parts, hardware, and clear instructions. You should be able to put it together with very little hassle. In conclusion, you will require a workbench that offers a roomy worktop, sturdy construction, and just enough storage space for your work. If you are looking for a more permanent fixture for your garage, then you will find that the Seville Classics and the 2X4 Basic workbenches are most suitable for you. 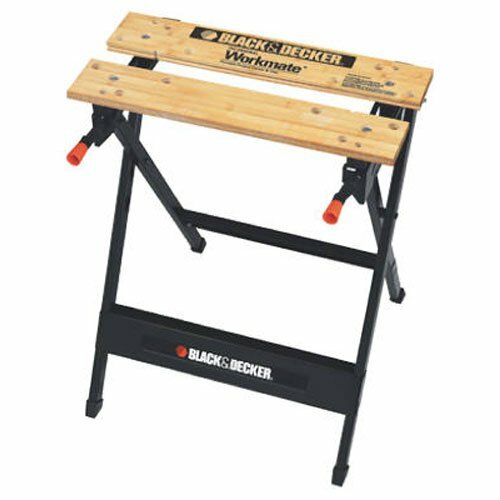 On the other hand, if you are looking for one that is smaller but still quite versatile, then the BLACK+DECKER bench is a better option. 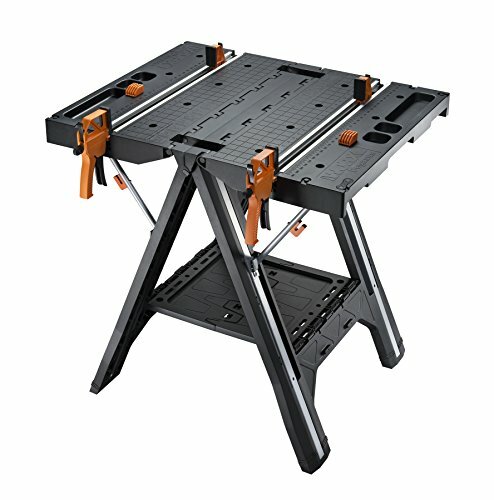 In case you are looking for workbenches that have some additional features such as clamps and storage, the Keter and WORX are the perfect choices. This guide should provide you with all the information, details, and tips that you need to choose the best possible workbench for your projects.